The newly signed memorandum of understanding between development organization Cuso International, the Georgetown Chamber of Commerce and Industry, the Small Business Bureau and private enterprise GeoTechVision Guyana will promote cooperation between the organizations to establish a business incubation centre or business incubator. GEORGETOWN, GUYANA – Four organisations came together Thursday afternoon to officially get Guyana’s first business incubator off the ground. In an official signing ceremony, Ms. Rajdai Jagarnauth, Permanent Secretary for the Ministry of Business, Mr. Vishnu Doerga, president of the Georgetown Chamber of Commerce and Industry, Ms. Valrie Grant, Managing Director of GeoTechVision Guyana and Tariq Williams, regional programme officer for Cuso International, agreed to come together to engage in awareness campaigns, workshops, and competitions to help to get Guyana’s first business incubator started. “I feel very satisfied and pleased that this process is beginning. I would call the signing a beginning of things to come,” said Patsy Russell, a Cuso International volunteer who is the coordinator of the initiative through a placement at the Georgetown Chamber of Commerce and Industry. Russell added that she felt a public-private partnership was the best way to establish the incubator, especially as the incubator plans to target young entrepreneurs. A business incubator helps to develop start-up businesses and fledging companies by providing them with targeted resources and services. It addresses many of the problems new businesses face, such as unaffordable workspaces, lack of access to finance or appropriate mentoring. Permanent Secretary Jagarnauth said this initiative was an important one for Guyana. Thursday’s signed agreement follows the successful seminar put on at the beginning of June that saw more than 150 small business owners learn about business incubation from Caribbean and international experts. One of those experts is collaboration partner GeoTechVision Guyana. 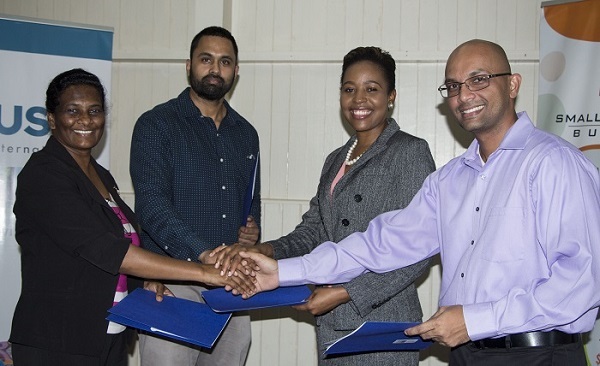 Last year, the World Bank Group InfoDev selected GeoTechVision as a business enabler to provide training and mentorship to other Guyanese companies. “Being entrepreneurs ourselves and having gone through an incubator ourselves, we figured that this would be an ideal way to contribute to the ecosystem here in Guyana,” said Grant, GeoTechVision’s managing director, adding that being able to work with so many partners on the initiative was special for them. This initiative is particularly important now, Russell, the initiative’s coordinator said, given the recent world-class oil discovery off the coast of Guyana, especially for young entrepreneurs.